In Australia, children learn early of a glorious national legend born at dawn on April 25, 1915. Unlike most such legends spawned by the Great War, this one continues to exert an enormous hold years later. In fact, tourists like myself who were visiting during the 75th anniversary were told that in many ways the 1990 australian commemoration of Anzac Day was the grandest and most elaborate since the tradition began in 1916. To a visitor, the long list of Australian 8,325 dead published by the Melbourne Age was astonishing enough, but it was only a small part of the huge media attention given this special anniversary. For weeks before (and for days after) the 25th, the nation's papers carried stories elaborating on Gallipoli. Old pictures, diaries, maps and extended commentary on all its aspects flourished. Special television documentaries flooded the airwaves. Gallipoli, the Peter Weir movie, was revived. A special commemorative stamp series was issued. And the Anzac Day parades all over Australia, always the focal point of the holiday, were larger than ever. Over 100,000 people were estimated to have actively participated, while many millions watched on television. The climatic events were special on-the-spot ceremonies at dawn and noon on April 25th at Gallipoli itself. These involved 58 of the surviving "Diggers" and a spate of Aussie politicians led by Prime Minister Bob Hawke. Naturally, this was all covered live on television. Getting the 58 old soldiers safely there and back was in itself a complex and touchy undertaking, since the youngest was 91 and the oldest 103. They flew in a chartered 747 with a complete team of medical and military personnel to look after them. Presumably, I was not the only visitor to wonder at this huge outpouring of feeling about events that have been largely forgotten elsewhere in the world. What is it about April 25, 1915 that still exerts such a hold on Australia? The basic facts are well known. That remote dawn saw the Anzacs (The Australian and New Zealand Army Corps) land on the Gallipoli Peninsula for what was to be their part in the Allied struggle to capture the Dardanelles from Turkey. This strategy, forwarded by First Lord of the Admiralty Winston Churchill, held rich promise. Cutting off Turkey as an effective German ally would materially assist Russia, possibly breaking the terrible stalemate along the Western Front, and result in a "triumphant peace". Unfortunately, many things went wrong in the campaign's execution, and the Allied forces eventually withdrew in December 1915 after it had become obvious that they, too, were bogged down in a hopeless stalemate. Although the Turks never managed to dislodge the invaders, the Gallipoli campaign was widely viewed by the world as an Allied defeat. As such, it seems unlikely material for an Australian legend. This apparently perverse outcome is conventionally explained as a result of Australia's unusual history up to 1915. With its convict heritage and federation coming as recently as 1901, Australia entered the Great War with the self-consciousness of a new nation facing its first test on the world's stage. 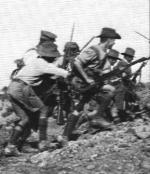 When Australian troops went off to fight honorably for the British Empire, the patriotic pride of the young nation marched in lock-step with them. The Melbourne Argus, one of Australia's best-known dailies of that era captured the prevalent spirit when it proclaimed that Australia had "in one moment stepped into the worldwide arena it he full stature of great manhood." When the appalling casualty lists began appearing in May 1915 in place of the expected victory, Australia was brutally traumatized. Perhaps some feeling for their shock can be gained by observing that Australia's total casualties at Gallipoli, on a per capita basis, would be equivalent to about 1,250,000 men in today's United States. What happened to the young nations's psyche under such extreme stress? At the time, they could at least bravely affirm that their sacrifices were in a good cause. But they also took bitter solace from reports that their troops had fought bravely (nine Victoria Crosses attested to this), that their fighting took place against tough odds, that these odds were disastrously worsened by poor planning and staff work, plus an error that landed them on the wrong beach, fully exposed to well-prepared, lethal Turkish defenses. In addition to their bravery, it was widely agreed that Aussie troops had shown remarkable initiative and an amazing spirit of comradeship. This "mateship" was thereafter considered to be an inseparable part of the "Spirit of Anzac" and was to become an expected attribute of all Australian fighting men. Neither Australians nor New Zealanders could be blamed for the disastrous errors of command, since the British had been in charge. Anzac troops performed as a unit and thus could be identified in press reports and their casualty statistics could be broken away from the cumulative number including British and French troops. The Gallipoli campaign lasted just long enough -- a quick defeat or victory would probably have disappeared from history; a more prolonged campaign would have tended to make its "legends" as diffuse as those developed on the larger fronts. The restricted but dramatic aspects of the Gallipoli fighting, in contrast to the extra-human juggernaut of industialized warfare on the other fronts, allowed colorful and coherent press reports stressing those individual qualities of bravery from which the "Anzac Legend" grew. Australia being a democracy, Anzac Day has encountered some controversy. This was particularly acute during the time of the Vietnam War, when anything having to do with war met huge resistance. It is interesting, though, that this year the voices raised against Anzac Day, instead of centering on the evils militarism, tended to be on the propriety of spending nearly $A 10,000,000 to send 58 old Diggers to Gallipoli, considering the current state of the Australian economy. A question of special interest to readers of this newsletter is in what way, if any, Australia sees the Anzac events of 1915 as still relevant to their society in 1990. I cannot give a full, scholarly answer to this, but I gathered the following from Melbourne's press. All commentators recognized that the 1915 concepts of Empire and military glory are obsolete. Most, though, echoed in some way the conventional thinking that Australia could still find "inspiration" in the dedication and heroism of the Anzac veterans. Journalist Bill Gammage wrote, "1915 is not 1990. In 1915 Anzacs were thinking about the future. We can thank them best and honor them if we think [of the bigger problems facing] the future of Australia." A few writers were pessimistic about any kind of inspiration; one conservative wondered solemnly whether the Australia of today would be able to find a similar central focus in time of equivalent strain as the country did in 1915. Whatever their views on the relevance of the "spirit of Anzac" to today's problems, all commentators recognized that the living Gallipoli Diggers are a rapidly disappearing national resource. L.P. Hartley put it in these terms of gratitude: "the past is a foreign country; they do things differently there. We're lucky to still have some guides from 1915 to take us there." As a member of the Great War Society, I applaud Australia and New Zealand's Anzac Day, when, without ambiguity, the horrible sacrifices in the Great War are still actively pondered and commemorated.